We were invited for a "complimentary day of play" to check out all Mountain Creek has to offer in the way of Summer fun. The girls and I had never been to Mountain Creek Water Park, and Nick had been a lifetime ago (when it wasn't Mountain Creek yet). So, on our very first day of Summer Break... we headed out to Vernon, NJ to see what kind of adventures we could have. Mountain Creek is almost exactly an hour drive from us here in Madison, NJ. A perfect distance for a day trip; they also have enough to do at the resort that if you're a fan of outdoor adventure it could make an amazing long weekend. While we spent our day splashing in the water and enjoying the view, Mountain Creek Resort also offers Mountain Creek Bike Park, Great Gorge Golf, the TreEscape Aerial Adventure Ropes Courses, and Mountain Creek Zip Tours. The waterpark and the area surrounding the Mountain Creek Resort are really gorgeous. To enjoy the water features you find yourself walking up and down hills through wooded areas. This meant quite a bit of shade was available, which is awesome on hot, sunny, waterpark days. It also means that water shoes are a MUST. The terrain isn't good for bare feet or flip flops... so along with the usual sunblock... make sure you pick up a good pair of water shoes before heading to the park! Another of our recommendations is booking that cabana. While being a guest at Mountain Creek we were provided with a cabana, and we've had cabanas at other parks. It may seem like a splurge... but it is SO WORTH every penny. You are in a reserved area, and assured chairs and shade. "All cabanas ave an open area, a shaded area, a table with four chairs, two lounge chairs, a locker and outlet for electric!" The cabana at Mountain Creek had a refrigerator stocked with water and some fruit. It also has waitress service. And, a big plus for those with older kids... you have a home base. I don't think I would ever do a water park without a cabana again. If you are the thrill ride type of person... Mountain Creek is your waterpark. 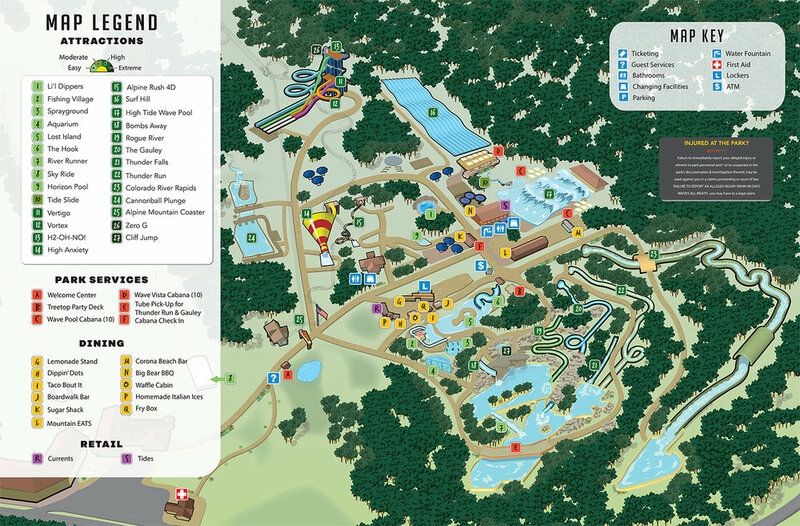 You'll notice in their map key that the majority of the rides are labelled as High or Extreme thrill... and they're not kidding. #23 - The Colorado River Rapids was absolutely high thrills! It was a blast... but Ana may never forgive us for that one. Thank goodness for those helmets. There were more than a few head-bonks (mostly between Ana an me!). If you have an adventure seeker like Zoe... they're in for a blast. But note... if you have a kid like Ana... you might have a long day at the wave pool. The High and Extreme rides were all too much for her (even though we had her on a few) and the easy rides? She was too tall. On the bright side... the wave pool was pure joy for her. 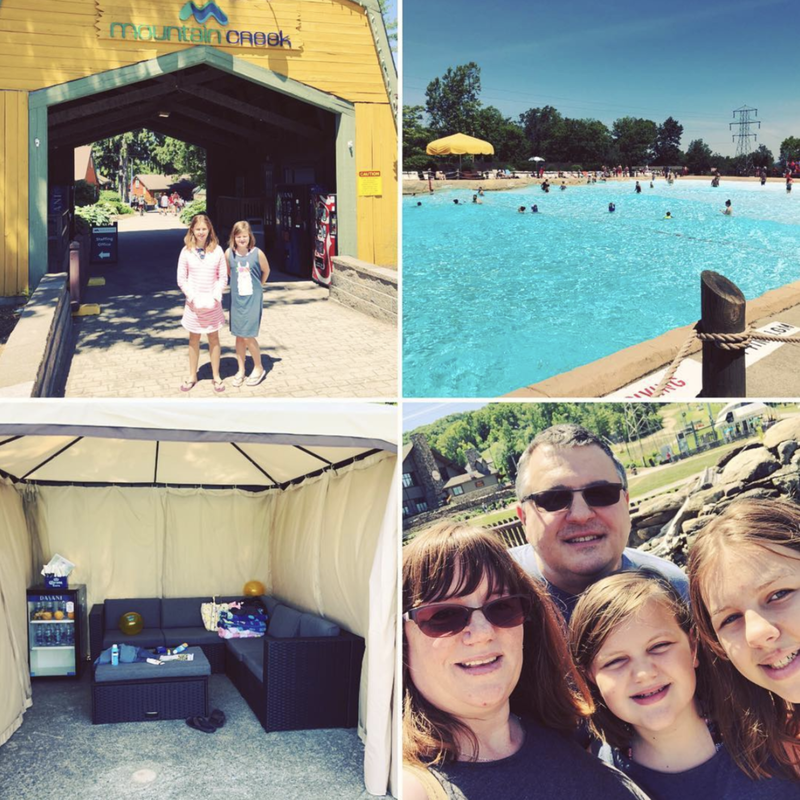 I highly recommend taking a visit to Mountain Creek Resort and Water Park (especially those who enjoy thrill rides and outdoor adventures!) Mountain Creek was kind enough to pass on 4 tickets for us to give away to our readers. If you'd like to take a visit, just enter by visiting us on Facebook and Twitter... and taking a look at the Mountain Creek pages as well! I have 4 tickets to giveaway to Mountain Creek Waterpark for the season. Tickets are valid until September 4th, 2018. US entries only. Must be 18 to enter. Winner will be selected on July 11th, 12 AM EST.